I’ve seen a couple of posts recently on getting more control over HDR based lighting setups, specifically in terms of getting crisper shadows. 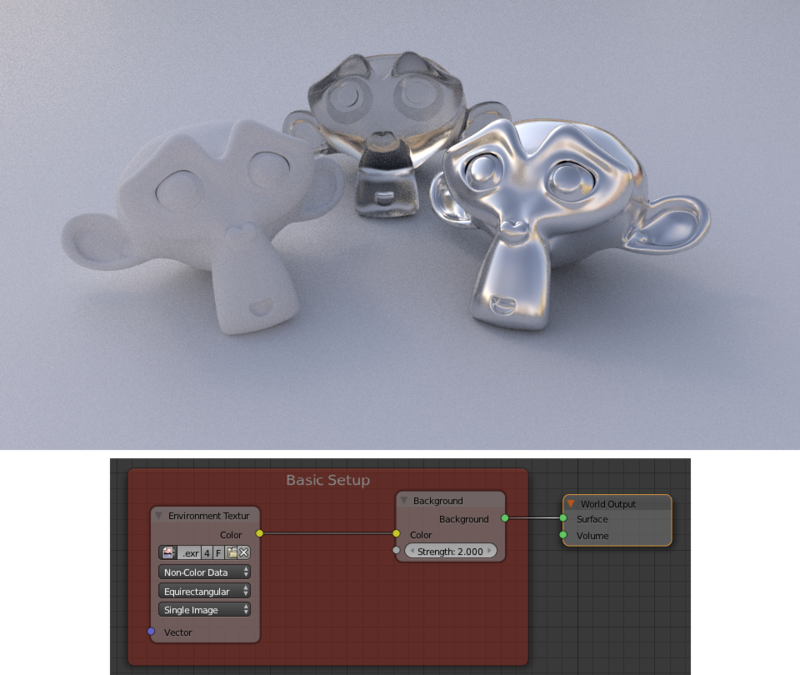 In particular Reyante Martinez and Greg Zaal each posted some great setups that used the colour of an HDRI map as the input to the strength node of a background shader. I thought I’d add my own experiments to the mix. Here’s a basic world setup for cycles. Just a HDR map plugged into a background node. No other lights in the scene. Here’s a setup based on one that Greg posted in his original article. 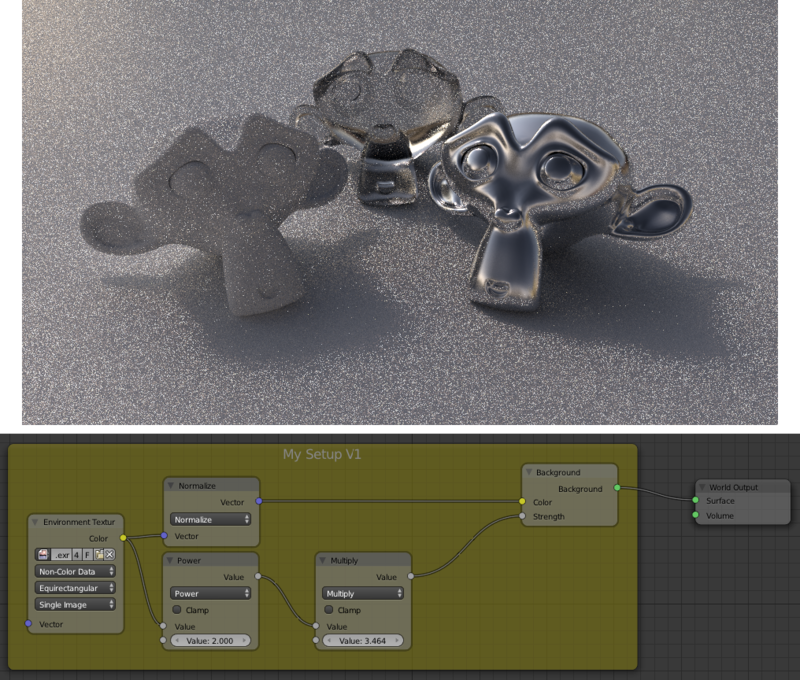 It gives stronger shadows by plugging the HDRI map into both the colour and intensity inputs of the background node. This setup was my first attempt, and I was mainly concerned with making sure my math checked out so that I could get my head around future setups. Here I normalised the input to the colour node of the background shader. 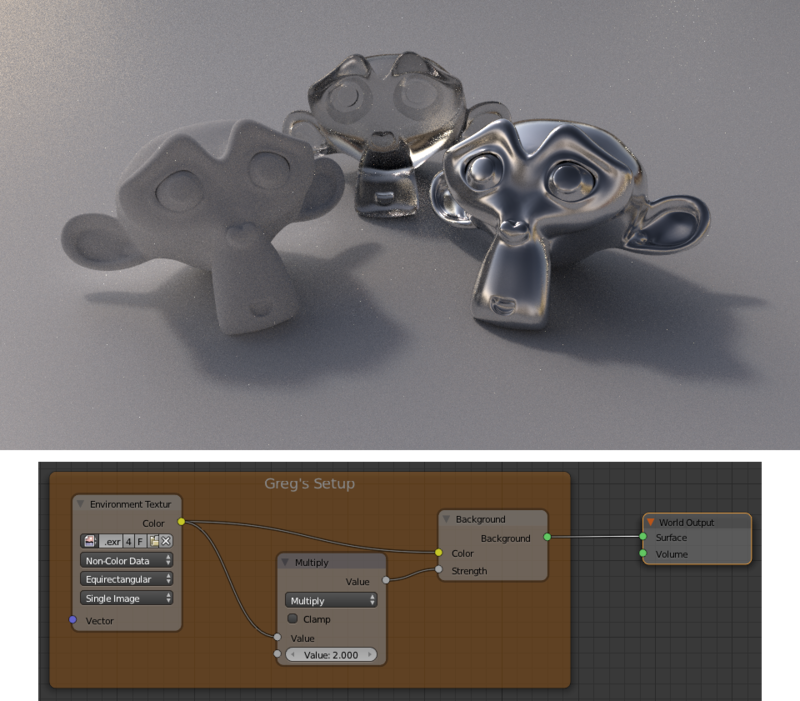 This gave the colour input for the background node a uniform intensity. I then extracted the value from the HDRI map and processed this separately, then used this as the input for the strength node of the background shader. By putting this input through a power (math) node first (or any other manipulation you prefer) I could control the strength and contrast of the lighting (raising it’s intensity to a higher power results in more contrast). The same effect shown above for Glossy reflections can also be controlled for transmission rays. So far it seems to work pretty well. If you give it a go I’d enjoy hearing your thoughts on it and how it worked for you. You can download it here. Note: The HDR map I used is not included. 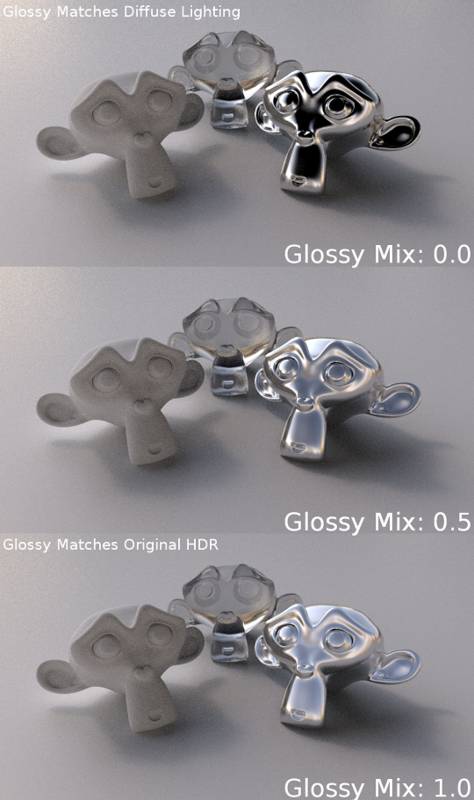 You can download it from BlendedSkies.com, which is a great resource for HDR panoramas as well as other stuff like pre-tracked footage and backplates for compositing renders onto. i was always wondering why everybody use “non-color data” for the color socket? why just don’t use a node with set to “Color data” for color input, and “Non-color data” for the strength. Also as i found all these contrast difference is due to .hdr which is linear and is threated as linear for values, but does it dispalyed properly(for sRGB) when rendring? I’m pretty sure that the colour/non-colour data option isn’t to important for HDR images, as they’re linear to begin with, and will be treated as such either way. It’s more relevant when using images with lower bit depths that you might not want to be assumed to be in sRGB colour space, such as masks or normal maps. Nope. Colour/Non-Colour is an assumption about colour space, not how many channels an input has. Otherwise you’d see no colour in any of the renders here! So my question would be that, how did you realized what has to be done to achieve this node setup, and how can i learn this? Now all we need is a way to render a shadow pass from this lighting setup so it can be composited on live plates. 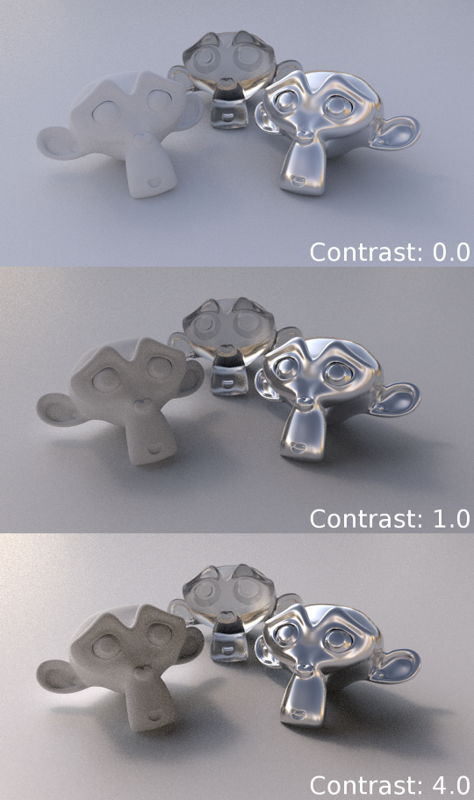 Unfortunately Cycles currently can’t seem to render a separate shadow pass for HDR lighting. Seems like you are burning the blues of the image. Why not just crush the blacks and raise the highlights of the rendered image if it’s contrast we’re after? 1) When I downloaded your blend file the file name said V1 in it. But yet you are discussing V2. Is the file you have available to download V2 or V1? The dropbox link is no longer working. Any chance I can download a copy of your sample blend file/node setup? I am doing research in anticipation of 2,8 and Eevee. I would like to find a way to use these effects for interactive 3D wegl output. 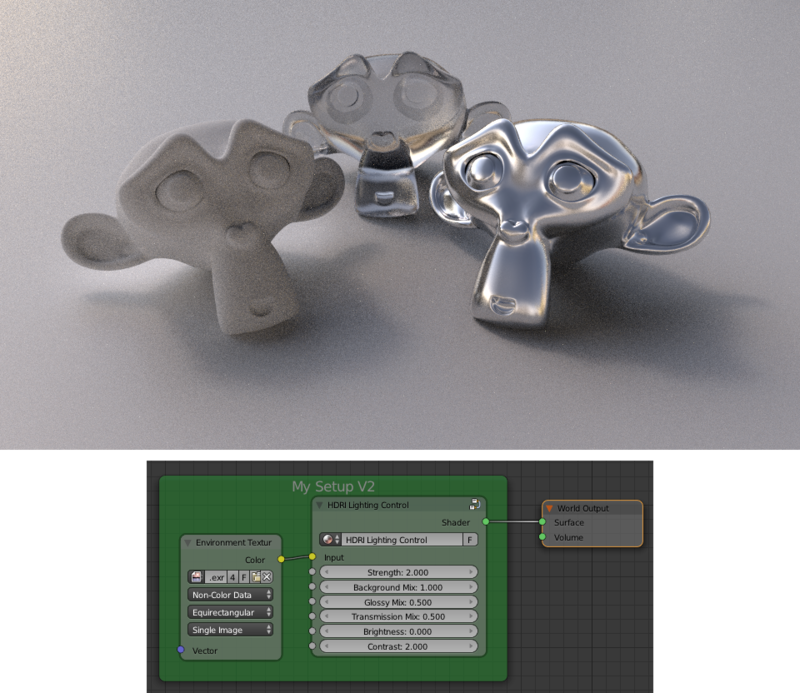 verge3D from soft8soft.com is my current tool of choice; though I have been patiently waiting for the release of 2.8 Eevee to be able to take advantage of the better materials and environment features.